This year’s economic achievements were modest and inadequate. In the background of slow economic development and inability to implement economic reforms needed to boost the economy, the government’s vision of prosperity in 2025 is a dream. Natural disasters impacted adversely on the economic performance this year, but the economic growth of only around 4 percent that is likely, cannot be attributed to these alone. The structural weaknesses of the economy persisted with sluggish growth in manufacturing, Industrial growth was mainly due to construction rather than manufacturing. Reduced output of food crops, mainly owing to drought and floods, reduced agriculture’s contribution to GDP. A few silver linings amidst these dark clouds gave hope of prospects of an economic upturn: An uptrend in exports, an increase in foreign direct investment (FDI), and a better articulation of economic policy, a budget that addressed fiscal fundamentals and envisaged a developmental thrust, were positive economic developments. Exports that had been declining began an upward trend since March and continued into the latter months. Government revenue was higher and there was a prospect of achieving the fiscal deficit target. With economic growth in the third quarter being 3.3 percent, falling from 4 percent in the second quarter, the prospect of achieving even an economic growth of 4.5 percent is remote, in spite of an expected higher growth in the fourth quarter owing to the growth in exports. While the dip in agriculture was understandable, the sluggish growth in manufactures that increased by only 1.9 percent in the third quarter was disappointing. The increase in industrial production in the first three quarters was due to the continuing increase in construction that is import dependent. The trade deficit that is of fundamental importance in improving the balance of payments and strengthening foreign reserves, deteriorated this year, despite export growth since March this year. The trade deficit for the first nine months of this year increased from US$6.4 billion to US$6.8 billion, and if current trends continue, it is likely to exceed US$9 billion more at the end of 2017. This increase in the trade deficit has been owing to imports being higher than exports. In the second quarter of this year exports amounted to over US$1 billion in each of the three months and continued into October and November when too exports exceeded one billion US$. This growth is expected to gain momentum and this year’s exports are expected to reach US$15 billion. It is therefore vital that imports are contained. Fiscal and monetary policies should be designed to reduce imports. However some of the budgetary proposals are likely to increase imports, while fuel costs may rise owing to international prices increasing and rice imports will increase at least in the first half of next year. Coconut imports are also likely. Vigilance on imports is needed to achieve a lesser trade deficit in 2018. Workers remittances and tourist earnings – have had a setback this year. Workers’ remittances have been the most important source of earnings for the balance of payments, offsetting as much as 70 percent of the trade deficit or more. Unfortunately, workers’ remittances have been decreasing in recent months owing to both political conditions and depressed incomes in many Middle Eastern countries. This trend continued in the nine months of this year when they declined by 7 percent from US$5,382 million to US$4,985. Yet they offset nearly 73 percent of the trade deficit of US$6.8 billion. The implication of this for the balance of payments is that lesser reliance has to be placed on the contribution of remittances to the balance of payments in the near future, as the factors reducing these remittances are beyond the control of the government. It can only be hoped that the political situation in the Middle East would be stable and that with the rise in their incomes owing to fuel prices increasing, remittances would improve. The unexpected fall in tourist earnings in September by 2.3 percent is of serious concern. Earnings from tourism increased by only 2.9 percent in the first nine months of this year compared to the same period last year, from U$2.59 billion to US$2.66 billion. This reversal of increasing growth in tourist earnings is a matter of serious concern as tourist growth was expected to be a significant source of economic growth by 2020 and 2025. Industrial unrest and obstructionist actions by the opposition were serious constraints to economic growth. The fear of opposition to reforms by trade unions and political parties has been a prime reason for tardy implementation of economic reforms, particularly the restructuring and reforms of loss making enterprises. The Central Bank (CBSL) revealed that there were 41 strikes last year that resulted in the loss of 104,327 work days. This was a ten-year high. Constant strikes of essential services to the community, was a social and economic disruption. The ineffective implementation of policies is admittedly one of the most serious obstacles to economic development. The government being fully aware of this has appointed a monitoring unit in the Finance Ministry to ensure effective implementation of the 2018 budget proposals. There is a need to institute similar mechanisms in all ministries to ensure effective and speedy implementation of policies. This is especially so as economic functions are bifurcated among about a hundred ministers. This year’s economic performance was far below expectations. Although drought and floods created considerable misery and hardships to the rural community, increased imports of food and fuel and caused inflation, the poor performance of the economy was not mainly due to this. The economy failed to attract adequate foreign investment, industrial production was mostly in construction and the country imported significantly more than it exported. The increasing trend of exports since March, higher FDI, fiscal consolidation and more determined implementation of economic reforms are vital for the economy to take off to a higher trajectory of economic growth. Lack of consensus on economic policies in the government, political considerations and unscientific decision making dominating policy formulation and constant opposition and obstruction to economic policy implementation were formidable drawbacks to the economy’s progress in 2017. 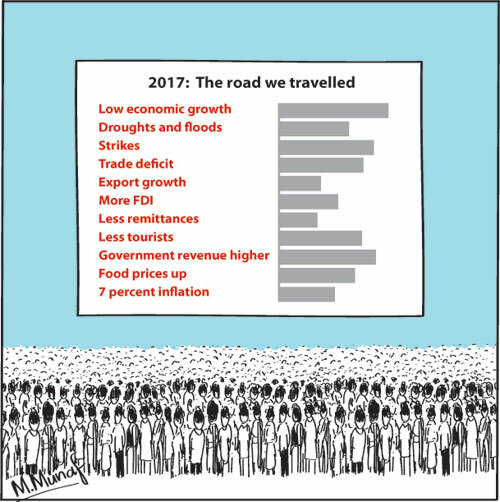 The optimistic expectations of Vision 2020 that expects the country to be rich and prosperous in 2025 is a far cry from the achievements of 2017.